What you need to do before the big day. The countdown continues to the big December test. We are now just 3 weeks away. I talked last week about sharpening your sword during this last month, which is critical for taking the test confidently and smoothly. But, what are some other things you can do before the test to help you gain a few more points and hopefully pass? Well, there are few more things to keep in mind before you head into the exam. Some of these things are fairly common sense, while other things you might not have thought about. And I feel like it is always good to have a quick reminder of what is important and what isn’t. As a matter fact, I made a mistake during the July test because I forgot some of this stuff, so it is probably worth repeating to a few folks. It’s important to get this stuff nailed down now, so that all that time and energy you have spent over the last few months (or years) doesn’t all go to waste because you flubbed up a few points. I don’t want to waste too much of your time, so I’ve made a handy list of questions you can ask yourself in order to find out if you are ready for the big day. Do you Know your Times? Some questions take more time to answer than other questions, but which questions should you spend more time and which should you spend less time on? This becomes more crucial as you move up in the levels. If you are spending too much time on the grammar section you won’t be able to answer all the reading questions and vice versa. You can use these times when taking a practice test to see what sections you are going through too slowly. Then, over the course of the next few weeks, you can hopefully increase that speed through more practice or simply knowing which questions you are going to have to skip or guess on so that you can focus on other questions. 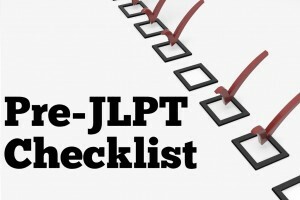 Read about how much time to spend on each JLPT question. This seems like a pretty obvious one, but it is worth repeating. Taking a practice test before the real exam has some serious benefits. You can pretty easily get stuck in a loop of just doing drill exercises here and there, and never really get used to the whole, grueling, sometimes up to 3 hours, test taking process. It can also give you feedback about what weaknesses you have before the big exam, so that you can focus your efforts on those before the big day comes. You can also test out your test take strategy and see if it is a good fit for you and your strengths and weaknesses. The official workbooks are available for free online. I’ve written up some notes for the N5 workbook that can help you. These official workbooks are essentially full-size practice tests, although some of the books might contain fewer questions than what is on the actual exam. These are good if you are in a hurry and just need a refresher on what kinds of questions are going to come up. Did you Decide on a Test Taking Strategy? After you take a practice, it is time to sit down and form at least a rough outline of what your test taking strategy is going to look like. What questions are you going to focus on the most? If you start to run out of time, what questions are you going to guess about? Some questions are actually worth more than others and these are the questions you are going to want to concentrate the most time on. Read about how much each question is worth and devise an attack plan if you haven’t already. If you are looking for some more detailed advice on how to formulate a test taking strategy, I just added a mini-guide (7 pages worth) to the JLPT Study Guide Kit that addresses this as well. Have you Built up your Listening Stamina? If you are not used to listening to Japanese on a daily basis. For example, if you don’t work in Japan, or work in a purely English speaking environment, then you will probably need to get used to listening a lot of Japanese. The reason for this is that, usually, when people study Japanese they may only listen to a short clip or a 15 minute lesson. You usually don’t have enough time to sit down and listen to a lot of Japanese at once. On the test though, you will have to stay focused for at least 30 minutes (and up to 60 minutes for N1). It can be very easy for you to drift off if you are not used to staying focused for so long. Drifting off for just a few seconds could cause you to miss a key piece of info and consequently miss the question. Read about how to increase your Japanese listening stamina if you need more help in this area. Did you Get All your Gear in Order? This is probably one of the last things you think about before taking the test, but it is just as important as some of these other things. You need have the right equipment for the test, so you are not running around on test day making sure it is all in order. For the July test, I wasn’t taking it too seriously, because I figured I would fail it. I ended up forgetting to bring a wristwatch with me to help time out the different sections. This wasn’t a big deal, but I think I might have spent more time on the reading section if I knew I had time to spare. Don’t make the mistake I did. 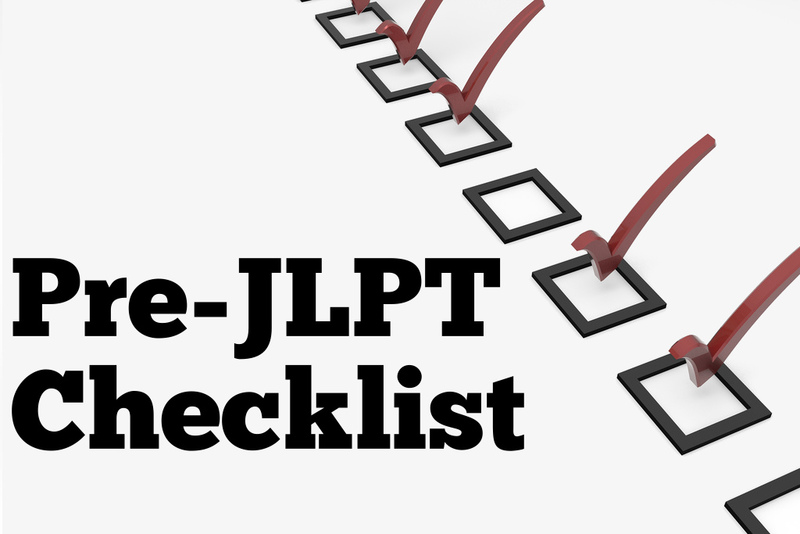 Read the full list of things you need for the JLPT, so you don’t end up forgetting something. Do you feel ready for the exam? Let me know in the comments. How Much is Each Question Worth? I’ve been studying hard for the last few months and I’ve done a couple of practice tests, yet I think I could still use the following weeks to work with my grammar. Anyway, let’s keep calm and focused for the big day! Ganbarou! Grammar can be a tricky beast. You think you got it and then you encounter something you have never seen before. I recommend trying to make some sentences with the grammar that is driving you the most crazy, and review them often. That’s always worked for me. I received my JLPT N5 results today and I’d just like to say thanks to you and your website. It was excellent help in passing the exam because I knew exactly what I’d be up against. Thanks from Ireland. Previous post: Is your Sword Sharp?